Susan's elegant Almost Argyle socks. Mygomi made argyle golf club cover, and in the round too (that seamless tube thing must work then, huh?). Eunny's Baby Argyle Vest is the cutest argyle on the Web! A little knitting history excerpt from The Social History of Knitting that credits the argyle fad of the 1940s and 50's as a colourful reaction to the relentless knitting of khaki for the troops during WW2. Argyle, Texas; Argyle, Nova Scotia; Argyle, New York; Argyle, Minnesota; and Argyle, Wisconsin. Buried in your own magazine archives, an article on designing with argyle in Interweave Knits Fall 2002.
and last but not least, the joined gussets on the Happy Socks, left unseamed for visibility. This was merely a matter of making the gusset decreases for as long as it took until they matched the finished pattern flap in length, and then joining and continuing on in the round. I am still decreasing for the gusset, but you know the rest. It's business as usual from here (phew!). I might have to make a pair of those someday. Now that's intriguing! I'm not sure I understamd why the gussets are knitted back and forth--is it just so you can fit in the bottom of that green diamond without having to carry yarn across the back? I am totally feeling the argyle! I was wearing some argyle sox yesterday and am planning something argyle for my spring projects. Thanks for all the tips! Those socks look great! Thanks for all of those links. For a skull argyle I might - might, I say - jsut consider it. I have pink and brown sock yarn...maybe a little lime and turquose for accent? There's also Kristine's ( http://obsessiveknitting.blogspot.com/ ) argyle vest ( http://www.flickr.com/photos/kimono/13732335/in/set-333225/ ). Somewhere there's a really cute photo of a two-year-old wearing it, but I can't find it right now. If you can still find a copy of The Social History of Knitting, it's worth getting. It's a really excellent book. This is very inspirational - your sock is so fetching that it makes me want to follow some of those great instructions and cast one on immediately! Which colors are truest to the sock? It's interesting to see how the light changes things. I'm making argyle socks and finding them anything but "happy." Maybe because I'm making them for a rather conservative guy? I love your happy socks. Have only just found your posts on knitting argyle socks. Thanks for listing those links. I have been struggling with seamless argyle socks and found Patricia Gibson-Roberts' instructions for knitting intarsia in the round in Interweave Knits, Fall 2003. When I tried to stop understanding the instructions and just followed - they worked! It's nice not to have to do a seam, but they are a bit of a tangle to manipulate. 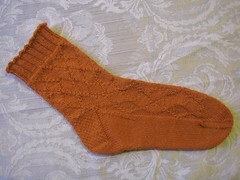 where can I buy this pattern for JAYWALK SOCKS?